Joel Bergner grew up several hours south of Chicago, in Bloomington-Normal, Illinois, and then lived for many years in Chicago's Pilsen neighborhood. While Joel took a few art classes in high school and college, such as figure drawing and photography, he was mostly self-taught and developed a unique style of drawing and painting inspired by his experiences in life and the people he encountered along the way. 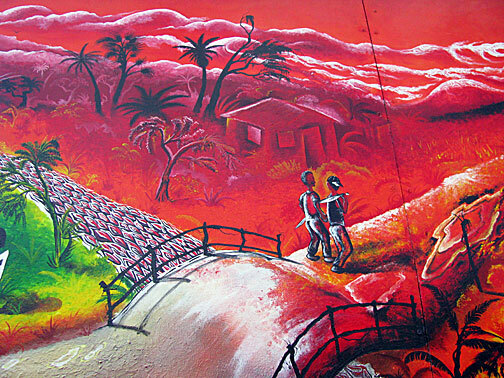 Detail of San Francisco mural De Frontera a Frontera. Pilsen-Little Village, on Chicago's southwest side, is the largest Mexican community in the US next to East L.A., and the vibrant culture there greatly influenced Joel's life and art. During this time he worked various jobs, from roof construction to restaurant work, but it was community-based work that became Joel's passion and direction in life. He worked closely with schizophrenic patients in a mental health facility and then went on to work with the homeless population in Chicago's Uptown neighborhood as a homeless center and shelter supervisor. Joel spent time in Honduras and later in rural Dominican Republic, where he worked for short periods of time as a volunteer doing construction work and teaching. These experiences and the people he knew in these places were influential in his art as it evolved. 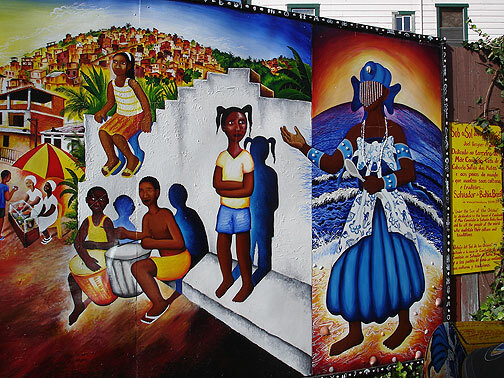 After returning from the Dominican Republic in the summer of 2002, Joel lived for a short time in New Orleans before continuing up to San Francisco's Mission District, a culturally-rich and strongly Central American and Mexican community known for its hundreds of beautiful, colorful murals. 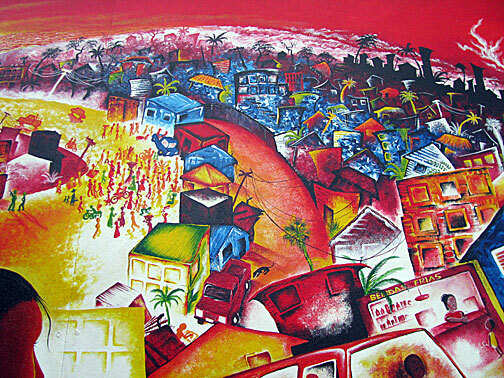 While Joel struggled to find work and had to live for months in his car, he immediately set out to work on a large mural based on his experiences in the Dominican Republic. 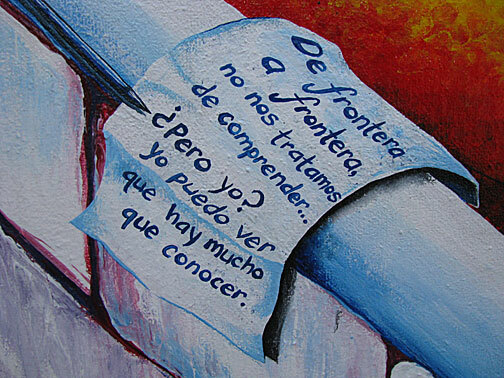 The mural, entitled "De Frontera a Frontera," was intricately painted with vibrant colors and took seven months to complete. 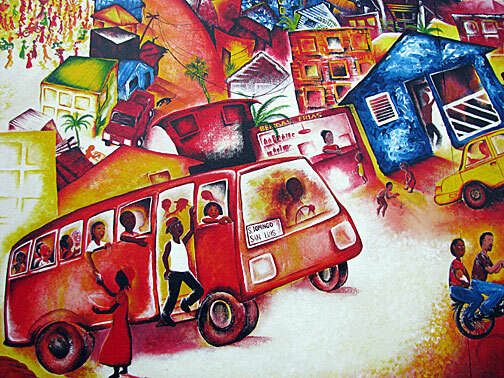 It featured social commentary on the relationship between wealthy tourists, Dominicans, and Haitians on the island, as well as everyday scenes of life in rural and urban areas of the country. 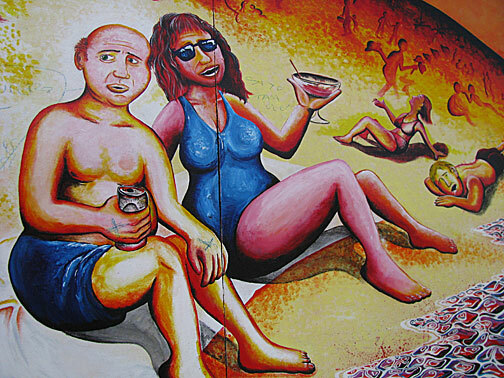 The mural was located at CELLspace on Bryant Street before it was torn down in 2017. 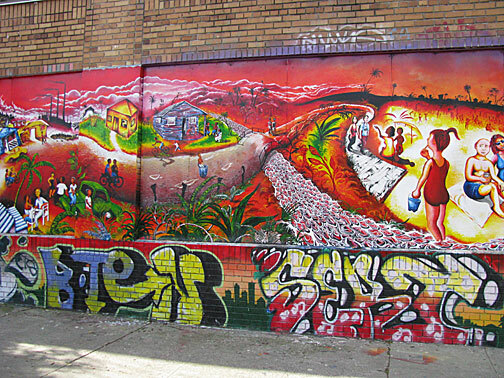 It made such an impact on the community that it was voted the "Best Public Mural" at the 2003 Precita Eyes mural award ceremony. In the spring of 2004 Joel worked for an organization in El Salvador as a teacher, and he was also an International Election observer for the presidential elections that year. He made close Salvadoran friends who he traveled with around the country. 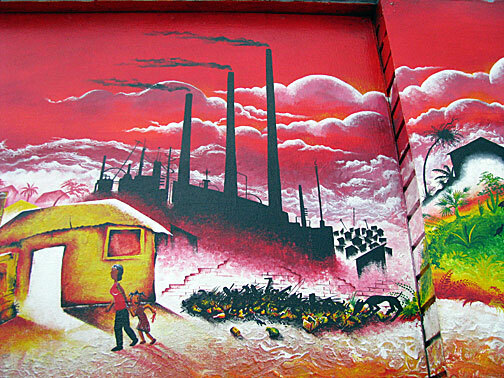 When he returned to California, Joel painted a mural based on many of the people he had known and their stories about the tragic civil war and the social and political situations of that country, as well as everyday life in El Salvador. 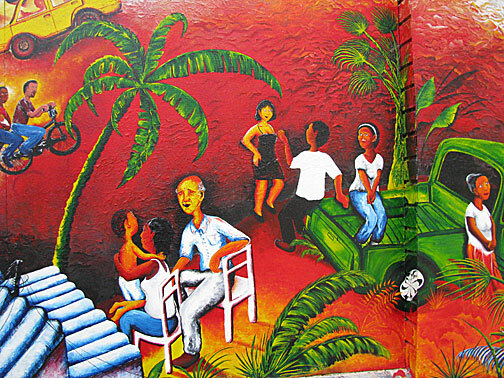 The mural, entitled |"Un Pasado Que Aun Vive," is located in the Mission District's famous Balmy Alley. 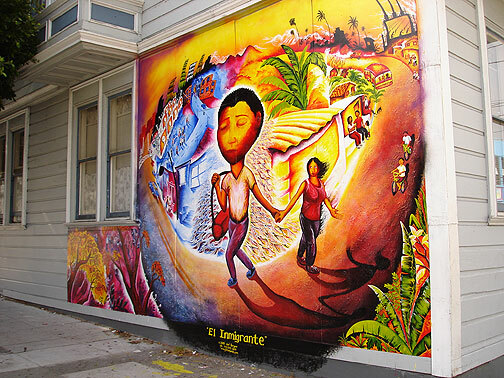 In 2005 Joel painted "El Inmigrante" on the corner of 23rd Street and Shotwell, which was recently featured in the New York Times. This mural is a story about a character who was based on the lives of many of Joel's close friends as well as people he has lived with in the Bay Area, who are from Colombia, El Salvador, Mexico, Brazil, Iraq, and other countries. 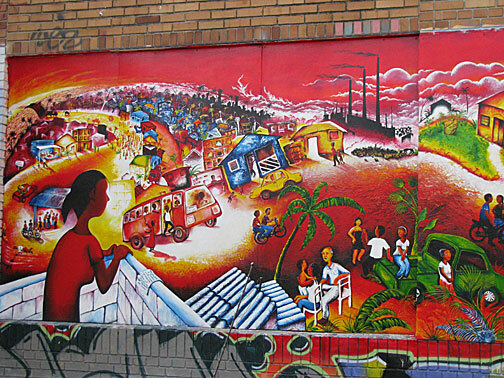 The mural shows the beauty and the hardships of the character's home country, his journey to the US, and his overwhelming new life in the large American city. In the fall of 2005 Joel went to Salvador da Bahia, in Brazil, to live with the family of some friends. During these months Joel taught English and art classes for children and learned Brazilian Portuguese. He lived in a community of Candomble, an Afro-Brazilian religion, and painted four paintings of the deities, known as Orixas, for the community. 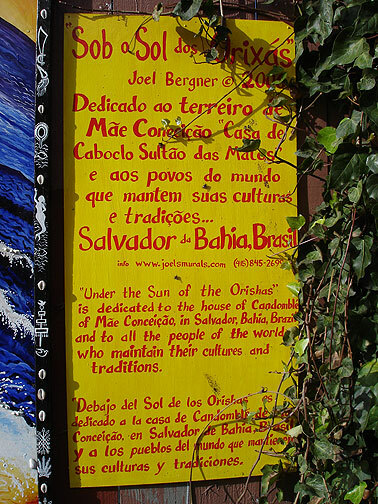 Joel returned to the Bay Area, where he worked on public art projects celebrating the culture and traditions of Bahia, the first of which is located in the "Brazil Cafe," a Brazilian restaurant on University Street in Berkeley. 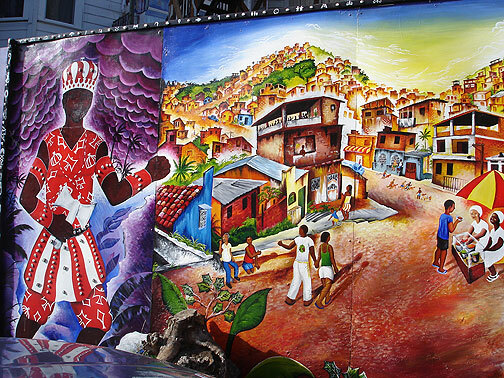 He also painted a mural called "Sob o Sol dos Orixas," which is located on 24th Street and Capp Street in the Mission. During Joel's four years living in San Francisco, he worked as a Residential Counselor in a treatment center for emotionally troubled teenagers who were struggling with violence, suicide, drugs, and other issues. He now lives in Washington, DC, where he has worked with foster youth, refugees, and immigrants from many different countries.